Harris Teeter, fairly upmarket grocery chain headquartered here in Charlotte, is my first choice for all my grocery needs. Since being back from Edinburgh (where I greatly missed HT) I’ve mentioned Harris Teeter on Twitter three times and never gotten a response. Two of the three are passive mentions, I didn’t expect a response to those (altho if they had offered me a job helping launch 201central that’d have been nice). However, the middle tweet is a direct request for customer service help that went unanswered. Why didn’t they reach out to me? It was a simple question and they could’ve redirected me to call their customer service helpline if they couldn’t answer my question themselves. 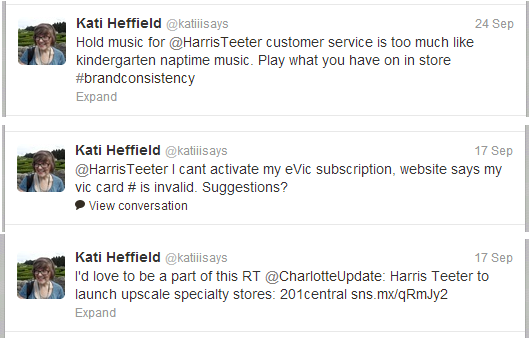 Harris Teeter is active on Twitter, tweeting almost daily, and as a loyal HT customer, I’m disappointed they ignored my customer service request. Please don’t think I’m calling Steve Hofstetter or his social media behavior ugly. The ugly I’m referring to is my reaction. 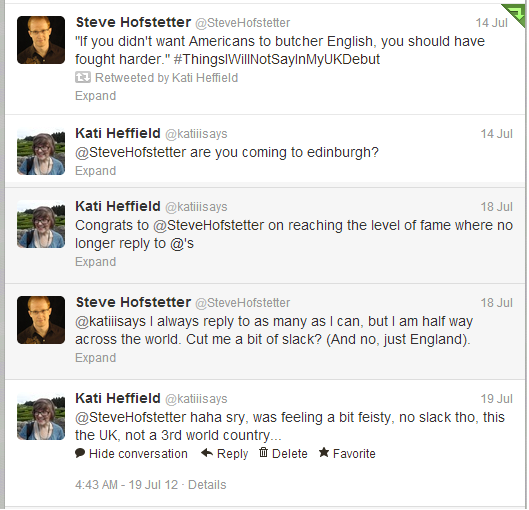 Steve’s a comedian I’ve interacted with on Twitter before. I tweeted him a question and when I didn’t get a response in four days I reacted childishly by calling him out on not responding. After I publicly drew attention to his non-response he apologized and answered my question. Although I got a response, I’m not proud of the method I used to get it. Maybe calling Steve out on his non-response left a sour taste in my mouth which prevented me from drawing attention to Harris Teeter ignoring me. The size of a company, nature of their business, and their social media activities all play a large role in how many consumers are going to use Twitter as a platform for complaints. What we learn from Harris Teeter: If companies want to maximize the positive potential for winning over unhappy customers via Twitter they MUST monitor incoming interactions with their Twitter accounts. A team of employees should be equipped to respond to complaints in a timely manner, even if it’s just saying “I don’t know the answer to that, but let me find out for you”. What we learn from CareerBuilder: You can ‘wow’ a customer who may not have directly reached out to you by monitoring keywords relevant to the brand on Twitter and responding with solutions to their problems. This leaves a more personal and memorable impression than any ad I’ve encountered. What we learn from my interaction with Steve Hofstetter: Brands- not responding to a tweet can frustrate followers to the point where they attempt to publicly call attention to your neglect. For frustrated followers- you might get the attention you were hoping for but at what cost? Instead of lashing out with a sassy tweet, it might be more appropriate to take a more positive approach, one you won’t feel bad about later. What interactions have you had with brands on Twitter? What is the maximum amount of time you think a brand should take to respond to a Twitter complaint? What companies are doing customer service “right” using Twitter or other social media platforms? Thank you for taking the time to write about your experience with CareerBuilder, we truly appreciate it! We would also like to thank you again for using CareerBuilder. 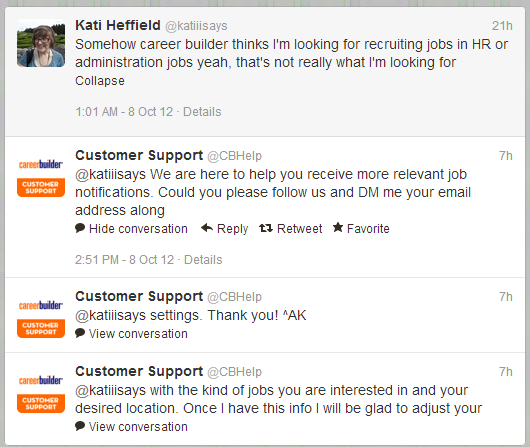 Please do not hesitate to reach out to us if you have any questions about CareerBuilder or your job search experience. I wish you best of luck! Excellent post. I like how you framed that up, and appreciate you mentioned our work at The Social Habit. Pink Washing- Is Awareness Enough?